You might call Rider a seafood restaurant, but the burger, simply called The Burger, is the star. Dining at Rider is a pescatarian’s dream. The newly opened restaurant in downtown Seattle’s Hotel Theodore pays homage to the ocean—the menu is a kind of casual gloat about the region’s access to incredibly fresh seafood. There are splashy seafood towers piled with local oysters, simple grilled fish, and crudo, chowder, toast, and tartare. Vegetarians will rejoice here, too, as vegetables aren’t just relegated to side dish status. Carrots and cabbage get the same treatment as whole trout and cuts of blackmouth salmon, transformed thoughtfully into carrot pasta with Calabrian chilies and shaved kohlrabi salad, its bright, acidic flavor balanced by the creamy, housemade cheese it sits atop. But down near the bottom of the menu, almost as though an afterthought, is The Burger. "The Burger" has only one name; like all the greats—Beyonce, Madonna, Prince—it doesn’t need more. 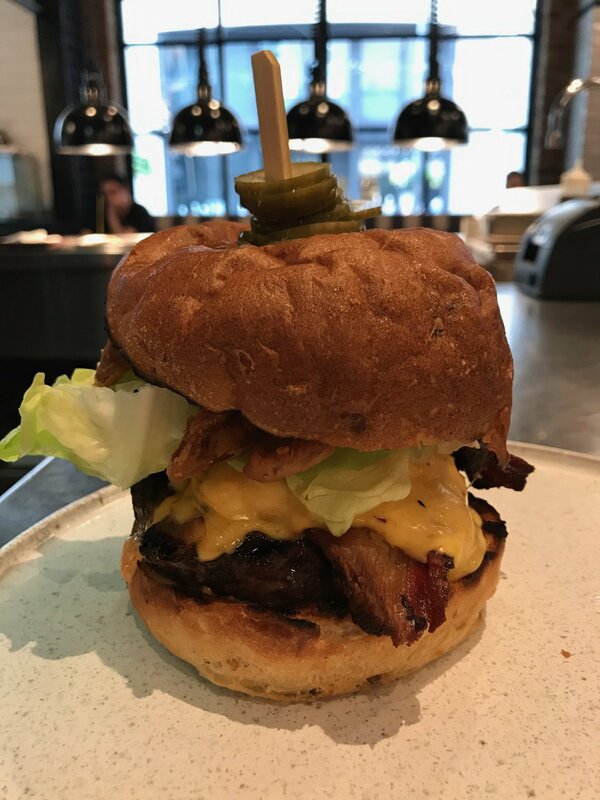 While Rider specializes in delicious, fresh seafood and vegetable dishes, its sleeper hit, made with the same considered sourcing and housemade ingredients, is the city’s best new burger. Helmed by David Nichols, the executive chef recently returned to Seattle after spending thirteen years in New York City, where he worked at Marc Murphy’s Landmarc. Though he loved the city, the Washington native is happy to be home, in part because of his access to the region’s edible bounty. Nichols grew up outside of Seattle, on a 300-acre farm in Cashmere, Washington that grows apples, cherries, and pears, and his grandfather raised cattle. A childhood surrounded by growing and producing shaped the chef’s philosophy on food. Onions are pickled in red wine vinegar first, then deep-fried, to add a sweet, tangy crunch, and the seemingly simple sauce is also made in a multi-step process. Tomatoes are smoked for hours over the fire (the six-thousand pound grill is a centerpiece of the restaurant’s dining room, and almost everything on the menu has some element that comes in contact with it), and the resulting tomato jam is folded into a housemade garlic aioli with pickles and Fresno chilies for added kick. The bun is the only other element of the burger that isn’t made in house, but Nichols chose wisely. “Living in New York for the longest time, I’m a huge fan of potato buns,” says the chef. “We use an 8-ounce patty, so it holds up to the burger, but it’s light, so you don’t feel like you’re eating all bread.” Seattle’s Macrina Bakery makes Rider’s buns, using unpeeled russet potatoes. While the rest of the menu changes with the season—depending on what the local fishermen catch that week or what foragers, or the chef himself, find in the lush outskirts of Seattle—the burger remains constant. All the great ones do.